This spacious, three bedroom farmhouse sports bold, front facing gables, bay windows, and generous front and back porches. The main staircase is positioned in the family room for convenience, and both family room and breakfast bay area are optimized by exciting two story ceilings. The master suite is privately located on the first floor and features a tray ceiling, his and her walk-in closets, and a splendid bath with every amenity. 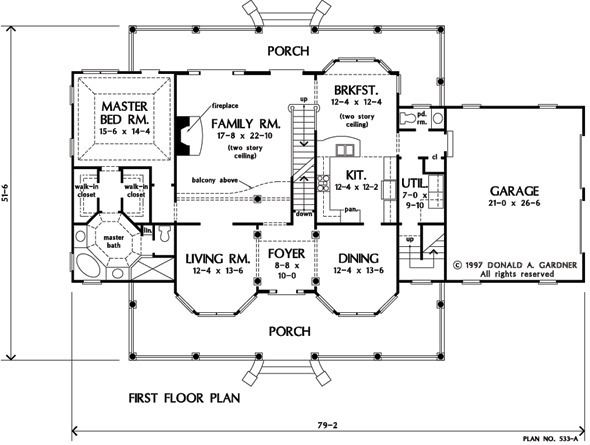 The second floor includes a loft that overlooks both the two story family room and foyer, while two bedrooms share a hall bath with double bowl vanity. 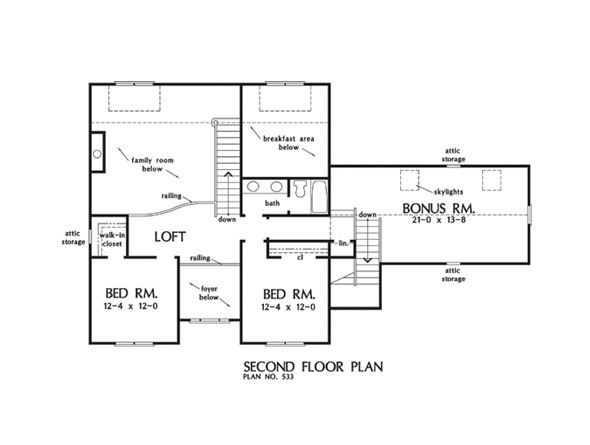 The bonus room is accessed by a second staircase as well as the upstairs hallway. 2nd Floor: 597 Sq. Ft.
1st Floor: 1914 Sq. 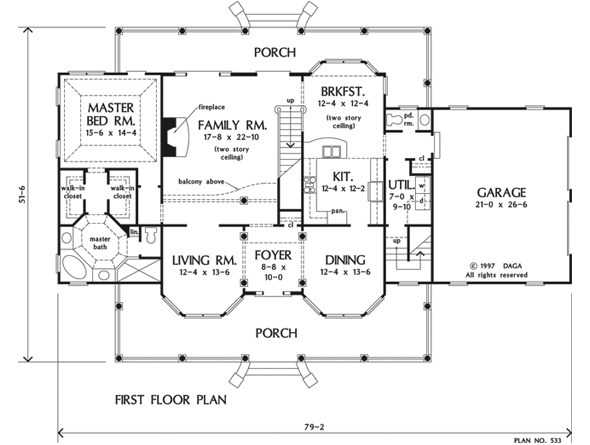 Ft.
House Dimensions: 79' 2" x 51' 6"
Great Room: 17' 8" x 22' 10"
Master Bedroom: 15' 6" x 14' 4"
Foyer (2 Story): 8' 8" x 10' 0" x 18' 0"
Dining Room : 12' 4" x 13' 6" x 9' 0"
Great Room (2 Story): 17' 8" x 22' 10" x 18' 0"
Kitchen : 12' 4" x 12' 2" x 9' 0"
Breakfast Room (2 Story): 12' 4" x 12' 4" x 18' 0"
Utility Room : 7' 0" x 9' 10" x 8' 0"
Bonus Room (Cathedral): 21' 0" x 13' 8" x 11' 4"
Garage : 21' 0" x 26' 6" x 0' 0"
Master Bedroom (Tray): 15' 6" x 14' 4" x 11' 7"
Bedroom #2 : 12' 4" x 12' 0" x 8' 0"
Bedroom #3 : 12' 4" x 12' 0" x 8' 0"
Porch - Front : 48' 8" x 10' 4" x 0' 0"
Porch - Rear : 48' 8" x 7' 0" x 0' 0"
Loft / Study : 16' 0" x 8' 0" x 8' 0"
Living Room : 12' 4" x 13' 6" x 9' 0"
Balcony : 16' 0" x 6' 0" x 8' 0"